Here to Stay: Why Human Recruiters Shouldn’t Be Concerned About Automation - Send and Receive Automated Call and SMS Text Campaigns. Technology has undeniably changed the game on how we execute different business processes across a multitude of industries. What once depended purely on the skills of humans back in the day is now made a whole lot easier with the help of machines and computer programs that remove a large chunk of work from the whole process. Thanks to automation, work is becoming increasingly efficient and can be completed faster than any time in history. There is no question that this level of progress is much embraced. However, it comes a risk—of humans being removed from the workforce. This removes the comfort, meaning, and value of human effort, establishing the misconception that automation is going to replace the jobs of humans fully. 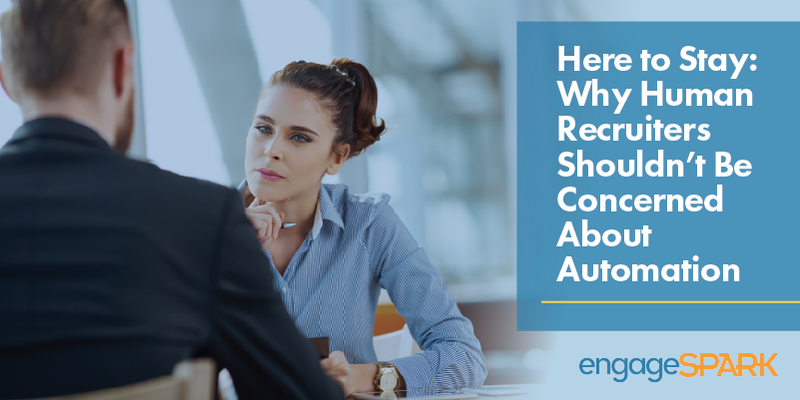 Despite this, there are still many business processes that automation cannot fully take over, and one of them is recruitment. It’s a given that technology has made vast improvements in our lives, but has also raised questions about the role of humans, as both artificial intelligence and automation lower the cost of both goods and services, forcing us to find new challenging roles that aren’t tied to the kind of work that we are used to. While machines have revolutionized the manufacturing sector, AI and automation are starting to make a huge impact on white-collar professions like recruiting. The collection of data through resumes, data processing, and other predictable jobs with deliverables falling under well-defined rules are the ones perfect for an automated recruiting system. Although these jobs could be amplified under automation, there are those that still require the human touch to make the whole process work. No tool can simulate empathy, EQ, or common sense, which is necessary for recruiters. Technology may make front-end recruiting activities easier, but empathy, EQ, and common sense are what set humans apart. A huge part of the recruiting process would need someone who has abilities to read and understand people through their words and body language. Not many people can pick up on these subtle signals, with only the skilled experts knowing how to gauge them appropriately. There’s no substitute for the importance of personal relationships and intuition. Automation is ideal when we are looking to cover hard or technical skills, but when it comes to soft skills, these are a lot harder to automate. There is no way automation can replicate how people interact effectively and harmoniously with others. Regardless of industry or sector, there is no substitute for the importance of personal relationships and intuition. Candidate care and relationship building are crucial to avoid treating them like a product. People are not commodities, so once you’ve gone over the initial phase of the recruitment process, it’s time to establish genuine interactions. Experienced recruiters should know how to sell the dream to candidates as they try to build their careers through the job opportunity you helping them to get into. You should not be concerned about being replaced by AI and automation, but instead, rejoice in the role they will play in reducing the burden of all the administrative tasks. This will reduce a lot of time by automating all the simple technical tasks so that you can focus more on the intangible things that AI can’t replicate like building relationships with candidates and developing strategies with business partners. These are essential factors that bots won’t be able to take over any time soon.